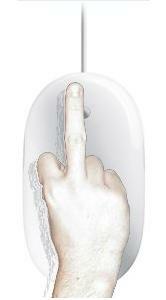 Apple released the Mighty Mouse today. Leave it to Apple to “innovate” themselves into making a zero button, four button mouse. Yes, they added some space-age alien technology to sense your “clicking” through the shell so that there would BE NO BUTTONS. Because, seriously, the fact that there are buttons on my mouse is the BIGGEST SINGLE PROBLEM in my daily digital life. How many companies would spend so much time and thought building a mouse that works seamlessly with the world’s most advanced operating system? Here’s a hint: You can count them on one finger. Yeah, and I’m not having a lot of trouble deciding which finger to use, guys. Update: Foxtrot noticed the same news item and had a funnier spin on it. Thanks to Karl for the link.